Our blue cranes and white hiabs may already be familiar to you. They're visible daily in the Bay of Plenty, and they're an increasingly common sight throughout the central North Island. We're delighted to introduce ourselves further. McLeod is a family company, specialising in cranes, hiabs, transport and drilling rig logistics. In each of our activities, we're determined to be - and be known as - industry leaders. It's a strong and motivating ambition. It's one we've kept to since our foundation. And it's one that's brought us significant achievement. It's the driving force behind our continuing growth and expansion. Put simply, we're determined to earn unrivalled customer respect. We have depots located in Mt Maunganui and Taupo, serving customers and industries throughout the Bay of Plenty and Lower Waikato regions. From here, we reach out to support our customers' more distant needs. Our company was established in 1995. Our values now are as they were then. They're centred on building and maintaining customer relationships through absolute operational reliability and sincere, personalised service. These are more than words. Because we hold these values fast, we're committed to providing unsurpassed customer service. It means assured value for money, absolute promptness, measurable efficiency, up to date equipment, and highly skilled operators. Underpinning these values is our safety record. We were Winners of the New Zealand - Best Health and Safety Intuitive for a Small Business in 2012. We were a Finalist for the same Award in 2013, and finalists for industry leadership in 2014, 2015 and have also won the 2013 Construction Health & Safety Leadership Award. It's not an area we take for granted. Health & Safety is a constant emphasis 24/7. We mentioned our operators. We seek the highest levels of professional commitment among our entire team. It shows. Our people are ready and able to help you choose the right equipment and methods for individual needs, the precise job at hand. They'll provide expert, trained and experienced advice and guidance throughout all stages of your project. All these qualities and our aspirations can be summed up in two things. We know how to listen to our customers and we continuously strive to outperform their expectations. The Company is managed by Scott McLeod, Peter McLeod and Phil Hutchinson. We're proud, every one of us, to continue in the traditions set out by our widely remembered and respected founder, Curly McLeod, who sadly passed in 2012. 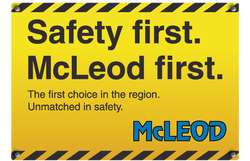 See the Team behind McLeod from Management, Health and Safety, Operations and Dispatch to Accounts.